Accompanied by my 11-year-old daughter, I marched in a protest rally for the first time in my life at the Ann Arbor Women’s March. These are a the four themes that brought me to the streets to make sure my voice is heard. As my representative, I ask for your help with these concerns. Threats come in many different forms, and I’m seeing proposals that exponentially increase those threats. Freedom from violence is the most basic form of securing one’s body. Donald Trump’s track record of sexually predatory behavior normalizes violence against women. This is unacceptable at all levels, and we need to promote a culture that does not tolerate violence. Violence may be the most acute challenge to securing one’s body, but climate change is the single greatest threat to the security of all of our bodies. Where will we grow food 50 years from now in an ever warming world, while our cities flood? The time for science and action is now. We need global protections here and that can only come from American leadership. Access to health care, including her reproductive rights, are also basic pillars of being able to secure and mange one’s own body. Anything that threatens those services is a direct threat to her body, and unacceptable to me. 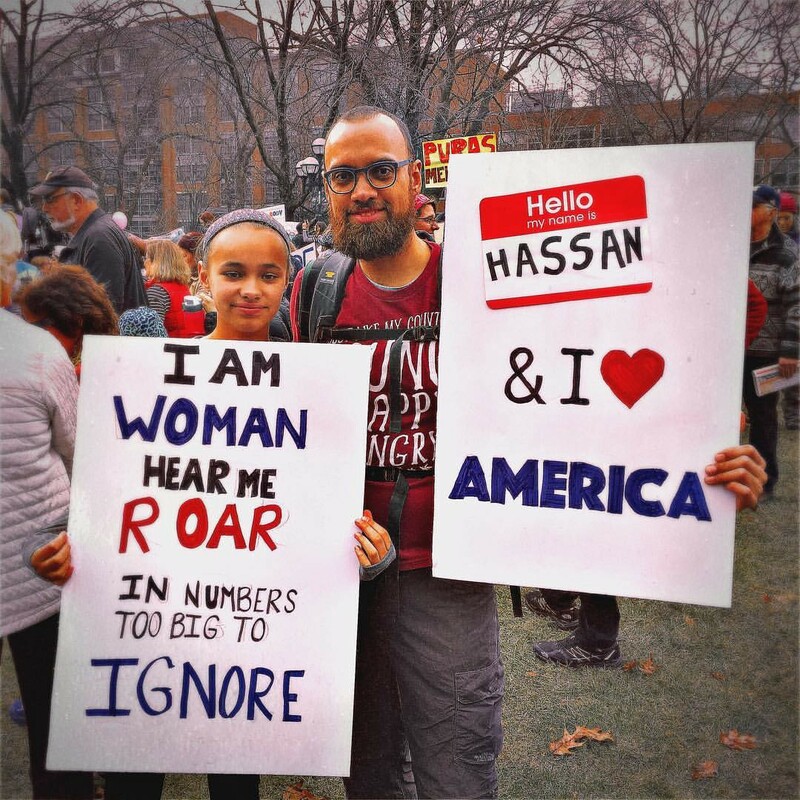 As we marched, my sign read “Hello, my name is Hassan, & I Love America.” I wanted to make it clear to my daughter that the reason we’re marching is because we love America, and I wanted to show her that it’s always okay to be who ever she is. When I was born, my American parents were living abroad — working for the US government — and they gave me a name that was popular in Sierra Leone. They also gave me an overseas childhood, just different enough to give me a perspective that lets me deeply appreciate the things that are great about America. I have lived in countries with leaders who flaunt the rule of law, and I can tell you its never a good idea. The anti-foreign, and anti-immigrant policies make me feel like my name is unacceptable, that people named Hassan, Abdul, Khadijah, Enrique, or Julio do not have the right to love America and to be patriots. It should not be this way. Our diverse backgrounds are what make America great. We need to embrace that and worry not just about white male Americans, but about everybody. Falling in love with and marrying my wife, has been the greatest event in my life. I feel as though my marriage is undermined if others are denied the same access that we have to a legally recognized bond. I want my daughter to have the right to choose who she builds a life with. When my daughter was three, she walked into the kitchen with a fat lip. Embarrassed, she quickly shared that, “I don’t know what happened … and I didn’t use daddy’s electric toothbrush.” Five minutes later she was fine and we had a wonderful teachable moment. She hasn’t lied since. After seeing the first few days of the Trump Administration, I am not seeing the same commitment to honesty that I expected from her when she was three. I’m not naive enough to think that our government could function without lies, but those should be reserved for things done in the national interest, not for grand-standing about things that are easily disproved, like election results or inauguration turnouts. I view honesty as a minimum requirement for participation in civil society, let alone being president. I ask you to confront Trumps lies at all levels, particularly when it comes to the ways that emoluments clause of the constitution is being violated. Trump has previously announced plans to leave his businesses, however he has not done this. Regardless of any policy disagreements, he simply cannot be trusted to be an ally of the American People until he is not profiting from the presidency while being in debt to foreign banks and foreign governments. America’s place in the world. America has an exceptionally dark history — slavery, theft of land from native people, internment camps, etc. — but at the same time, America has also been a bright shining light in the world, fighting fascists, promoting democracy, aiding global security and helping to build up other countries while developing a global economy. We cannot abandon the values that on balance make us better than the atrocities that we have also committed. In much the same way that the fates of all Americans are linked, the fates of people around the world are also linked. America is part of that tapestry. If we don’t provide assistance to people outside of our borders, we create the next generation of terrorists and threats to the safety and security of my daughter’s body. At the same time, personal safety and security are diminished if it comes at the exclusion of other people’s safety and security. We can’t isolate ourselves from the globe or withdraw from the alliances that have kept us safe. Defend the Affordable Care Act. Maintain funding for planned parenthood and any organization that provides abortions. Demand that Trump leave his businesses and work for only the American people. Support the rights of LGBTQIA people. Support efforts to limit the impacts of climate change. Support diversity, increased immigration and access for refugees. Maintain our participation in NATO and to function as a leader of western civilization, spreading the benefits of democracy and progress. Footnote: The idea of maintaining safety and security of the black body is discussed at length by Ta-Nehisi Coates in “Between the World and Me,” and is not an original concept on my part. It is a very useful lens for framing an outlook on the world that ties the global to the personal.